The known structure of 5-fluorouracil contained 4 molecules in the asymmetric unit. The structure appears unlikely, as there are close fluorine-fluorine contacts. Such a structure would not be predicted in the search method used, but many known crystal structures fall into the space groups covered by the search. A search was carried out using an ab initio derived conformation. The energy of the known structure was calculated. The global minimum in the search was found to be ...... kJ mol-1 more stable than the next hypothetical structure, and ......kJ mol-1 more stable than the experimental structure. This compound can form 2 different polymorphs from a solution in nitromethane. 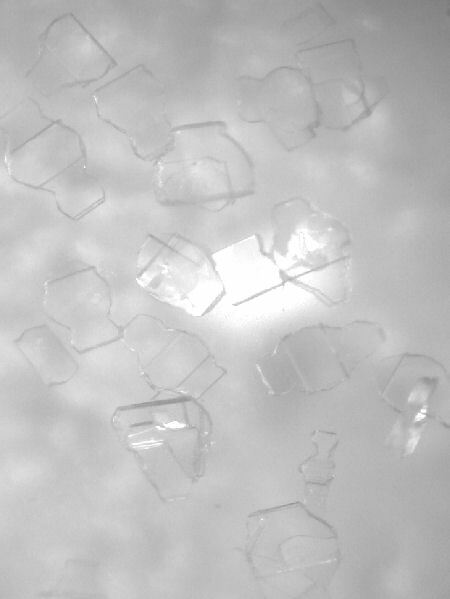 Repeated crystallisations have failed to regrow the new form. Slurrying experiments are reknowned for producing the thermodynamically most stable form, yet using methanol as the solvent gave the previously known form, which is believed to be a kinetic product.